Abstract. Radiosonde observations (RAOBs) have provided the only long-term global in situ temperature measurements in the troposphere and lower stratosphere since 1958. In this study, we use consistently reprocessed Global Positioning System (GPS) radio occultation (RO) temperature data derived from the COSMIC and Metop-A/GRAS missions from 2006 to 2014 to characterize the inter-seasonal and interannual variability of temperature biases in the upper troposphere and lower stratosphere for different radiosonde sensor types. The results show that the temperature biases for different sensor types are mainly due to (i) uncorrected solar-zenith-angle-dependent errors and (ii) change of radiation correction. The mean radiosonde–RO global daytime temperature difference in the layer from 200 to 20hPa for Vaisala RS92 is equal to 0.20K. The corresponding difference is equal to −0.06K for Sippican, 0.71K for VIZ-B2, 0.66K for Russian AVK-MRZ, and 0.18K for Shanghai. The global daytime trend of differences for Vaisala RS92 and RO temperature at 50hPa is equal to 0.07K/5yr. Although there still exist uncertainties for Vaisala RS92 temperature measurement over different geographical locations, the global trend of temperature differences between Vaisala RS92 and RO from June 2006 to April 2014 is within ±0.09K/5yr. Compared with Vaisala RS80, Vaisala RS90, and sondes from other manufacturers, the Vaisala RS92 seems to provide the most accurate RAOB temperature measurements, and these can potentially be used to construct long-term temperature climate data records (CDRs). Results from this study also demonstrate the feasibility of using RO data to correct RAOB temperature biases for different sensor types. 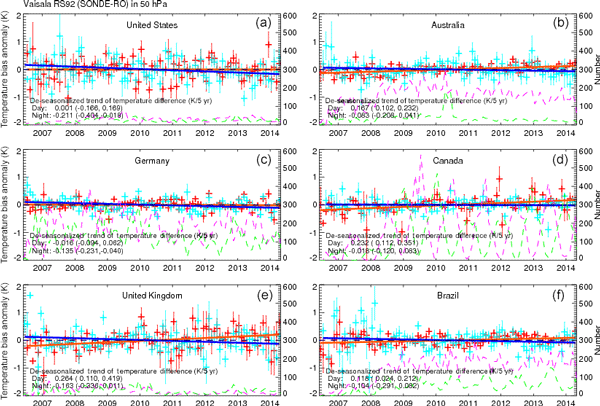 How to cite: Ho, S.-P., Peng, L., and Vömel, H.: Characterization of the long-term radiosonde temperature biases in the upper troposphere and lower stratosphere using COSMIC and Metop-A/GRAS data from 2006 to 2014, Atmos. Chem. Phys., 17, 4493-4511, https://doi.org/10.5194/acp-17-4493-2017, 2017. Radiosonde observations (RAOBs) have provided the only long-term global in situ temperature measurements since 1958. In this study, we use Global Positioning System (GPS) radio occultation (RO) temperature data from 2006 to 2014 to characterize the inter-seasonal and interannual variability of temperature biases in the lower stratosphere. Results from this study also demonstrate the feasibility to use RO data to correct RAOB temperature biases for different sensor types.